As solid as Tynion’s run on Detective has been thus far, this issue was frustratingly cliché and overly “hand-wavey” even from a comics stand point. 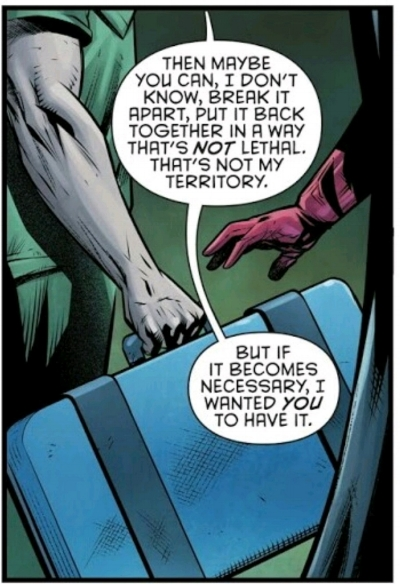 The issue is filled with lots of “of course” moments taking me out of the comic at times. If you've been following thus far, Clayface has been a member of the Bat-family albeit a ticking time bomb. The Victim Syndicate has returned with Anarky on their side in attempts to take down the Bat-family and have succeeded in causing Clayface to turn on the team. Batwoman continues to talk to her father and he gives her the Mcguffin gun to take out Clayface presumably in the final showdown. The gun is lethal, obviously going against Batman's no killing policy, but her father gives her a hand wavey excuse without explanation to just change it to non lethal by breaking it apart. This was not necessarily a problem initially but as the issue progresses it occurs far too often and is more noticeable once the issue is over. Tynion seems uninterested in Batwing and Azreal and sends them on a mission into the sewer. The issue fell victim, no pun intended, to telling as opposed to showing. There is such a thing as too much exposition. This scene literally made me roll my eyes, “let's hope we wasn't paying attention” and of course Clayface appears behind Azrael like a cliché monster movie scare. This scene had been a long time coming. Reading past issues, seeing Clayface’s and Cass’ friendship grow, this felt a lot more earned even if it was a but rushed. Immediately Tynion can't help himself by jumping from one cliché to the next, this time yelling “gotcha!” at the reader by Clayface turning heel.. again. The highlights of this series as of late have been Cass’ relationship with Clayface and the dichotomy and similarities that come with that. The panel with Cass' getting Clayface to come to his senses was by far my favorite art wise. From the image of Cass unmasked to all of the different Clayface stages back to Basil. Dave Wielgosz does a great job of taking Bruce Timm’s original design and giving it a more modern detailed feel. The First Victim is still such an interesting and cool looking villain that I'd like to see more of in the future. 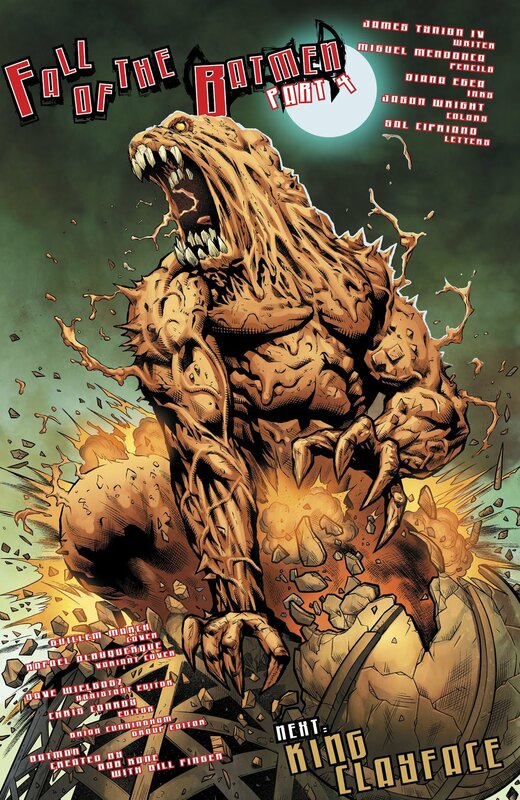 Let's not forget Godzilla Clayface.. badass! The story problems are not enough to stop reading or drop it from you pull drastically but they do become more apparent as the issue progressed. Personally I would still recommend the series as a whole for anyone to add to their pull looking for a fun read. Tynion has yet to truly disappoint and Godzilla Clayface should make to be quite the interesting read in two weeks.